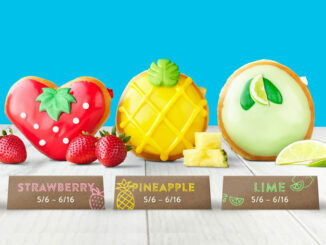 Yogurtland offers a taste of summer with the introduction of five new scratch-made seasonal flavors inspired by summer experiences and the fresh fruits and desserts associated with them. Available Now: Home Grown Watermelon Sorbet features a blend of the brand’s sorbet with fresh watermelon. Available Now: Sun Kissed Strawberry Shortcake features a blend of real California strawberries with real sweet shortbread cookies. Available Starting June 19: Sweet n’ Smooth Peaches and Cream Gelato features a combination of fruity tartness and creamy gelato for a real Freestone peach taste. Available Starting July 3: Larger Than Life Mud Pie features flavor layers of rich chocolate, coffee, and chocolate cookies. Available Starting July 17: Picnic Favorite Apricot Mango Tart offers a balance between sweet and tart, with a combination of sweet apricots and juicy mangos. To top things off, Yogurtland is introducing gummi butterflies as its newest limited-time topping. Additionally, Yogurtland will be offering two new collectible spoons, one featuring a red watermelon wedge and the other a slice of mud pie.